Little dogs seem to get all kinds of pawsome stuff! My sister, Little Bit, sure gets her share of nifty things and it makes me right jealous sometimes. To prove my point, we have a little Chiweenie friend name Sissy that’s just as spoiled as our Little Bit! She got a fun LazyBonezz Super Star pet Carrier the other day! Now, she gets to go all over the place with her humans. Makes me jealous all over again. I guess it’s only right as our humanz couldn’t lug us big girls around now could they WOOF! Lemme fetch Sissy’s Mom (Missy) to tell ya all about this fun pet carrier from LazyBonezz! 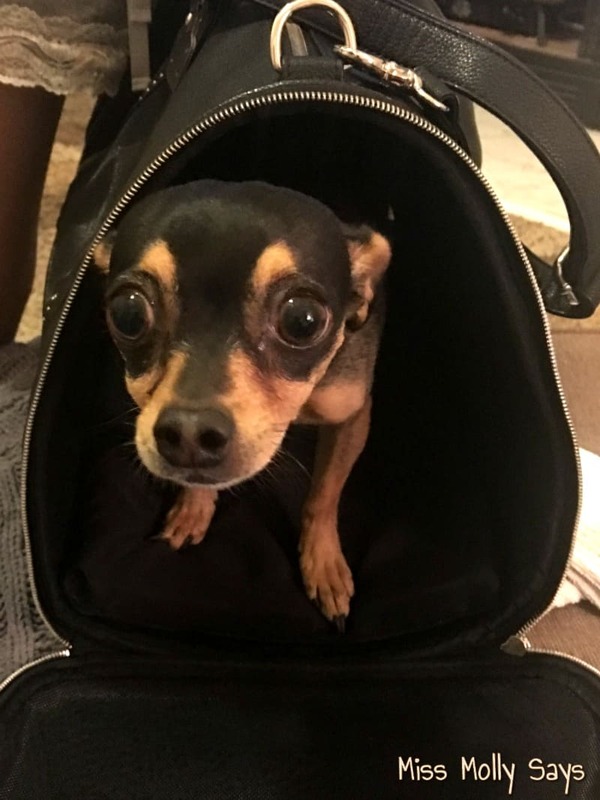 A huge trend, which started with celebrities and their little purse dogs, is carrying your pet anywhere. Why not make carrying your best friend fun and fashionable? LazyBonezz Super Star Pet Carrier is super fun, has lots of features and your dog will love it! I received this very rocker-like pet carrier, made of animal-friendly vegan leather. It’s super soft has plenty of room for doggie (or kitty, bearded dragon, guinea pig…), and a cool cutout star decorating it. 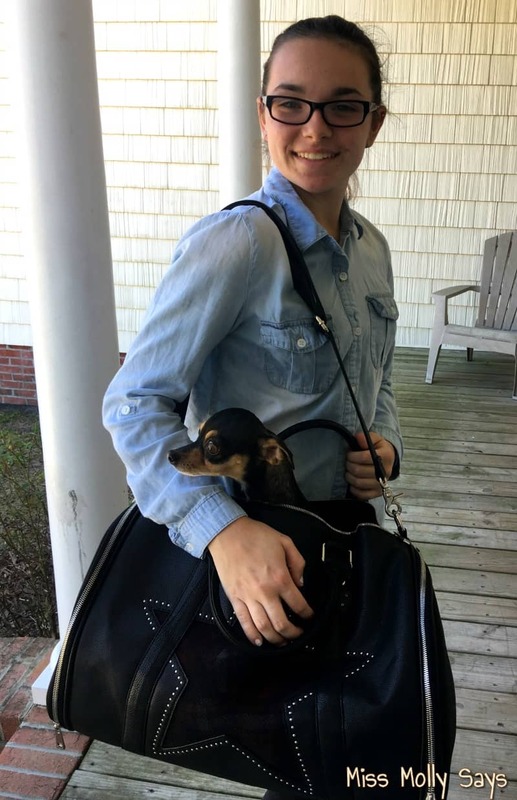 Our little Chiweenie, Sissy, (part Chihuahua and part dachshund) is all of six pounds, so this carrier has a lot of room for her to get comfortable. The bottom has a one-inch removable pad in the bottom, a small safety leash attached inside so doggie won’t jump out, both ends of the bag open for easy entrance and exit. It also has a long adjustable strap for carrying doggie and it has regular short handles for easy pickup. The Super-Star Pet Carrier will carry pets up to 20 pounds. 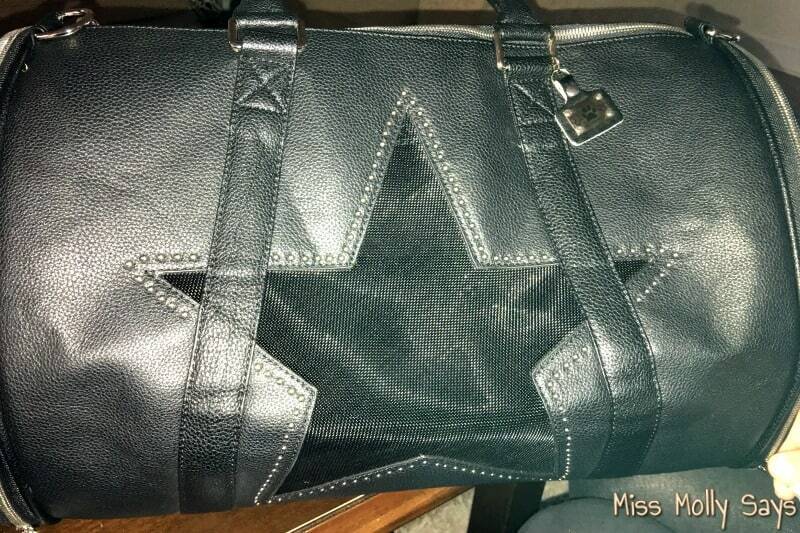 There is a really pretty (and rock star like) mesh cut-out star. This allows your doggie to bring out their inner rocker. Attach a fun scarf to the handles and make your style shine. Our dog, who is about 3 years old, she wasn’t sure about it. We don’t put her in carriers often. The most she is ever contained is when we are away from the house. So, putting her inside, she was a little nervous. But after she realized we placed her favorite blanket in it, she dug around, got comfortable and went out on a walk with my daughter. I am so excited about our Super-Star Pet Carrier. Since we got her, we’ve been wanting to be able to take her with us. She’s getting used to the car, but now that we have our very stylish carrier, she will be able to go with us any and everywhere! For more information on LazyBonezz and The Super-Star Pet Carrier, visit them online. We’ve added the LazyBonezz Super-Star Pet Carrier to our Petpalooza Gift Guide! Head on over and check out all the PAWSOME pet friendly items! This is so cute! My dog would not fit in that bag but I would love to doggie sit one that would! I always envied ladies who had their little dog with them when they went shopping, it looks so fun. This is so nice, I’d like to have a little dog like this some day! and it would be good to be able to have a carrier like this, too.